Ohtani, who also hit his first career homer on the road, singled in the eighth, stole second and scored the go-ahead run on David Fletcher’s double. The Japanese two-way star was understandably pleased with his performance. Ohtani has 11 home runs in his rookie season. He’s homered four times and is batting .643 (9 for 14) against the Indians in four games. 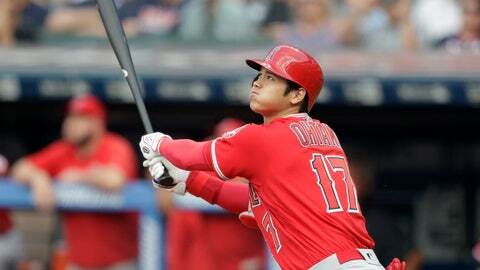 Ohtani was sidelined from June 7-July 2 with a sprained ligament in his right elbow. “Whether if I’m in a slump or I’m hitting well, I’m constantly making adjustments with my swing,” he said. Michael Brantley’s RBI double and Jose Ramirez’s run-scoring single tied the game in the first. Leonys Martin, playing his first home game since being acquired from Detroit at the trade deadline, homered and had two RBIs. Yan Gomes doubled with one out in the second and scored on Martin’s single. Gomes left the game in the fourth with right knee discomfort. Manager Terry Francona said Gomes was undergoing tests by the medical staff following the game. “It feels a lot better than yesterday with all the treatment and stuff, so that’s a positive,” he said before Friday’s game.